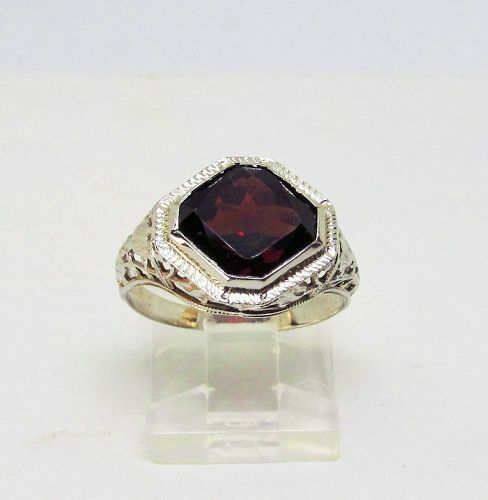 This 14Kt white gold and garnet filigree ring is from the 1920-s. The open work is decorated by flower motifs. The octagonal garnet measures 10 millimeters across. The ring is a size 6 and it can easily be sized. 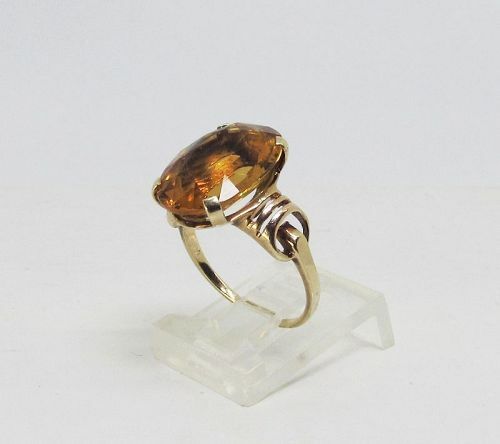 This 14Kt yellow gold retro ring is centered by a 15 X 12 millimeter oval faceted citrine (because of the color Madeira). The interesting open design ring was made in the late 1940-s or 1950-s. The ring is a size 6 and can easily be sized. A native is hunting a giraffe in this hunting scene from South Africa. 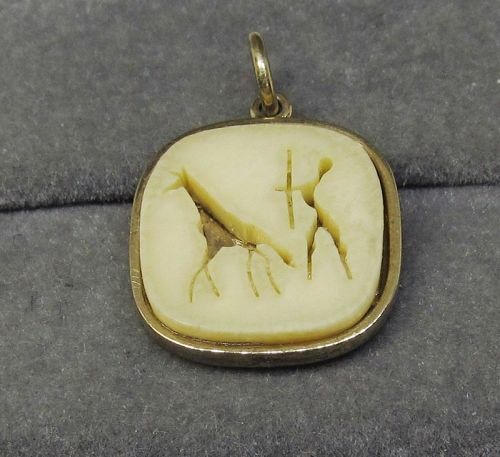 The scene is carved out of bone and set in a 9 Ct yellow gold pendant. The pendant is 5/8” rounded square, and 3.5 millimeters thick. A classic style 18Kt yellow gold ring is set with three 3 X 5 millimeter oval sapphires and four brilliant cut diamonds. The prong set sapphires are separated by 2 prong set diamonds. 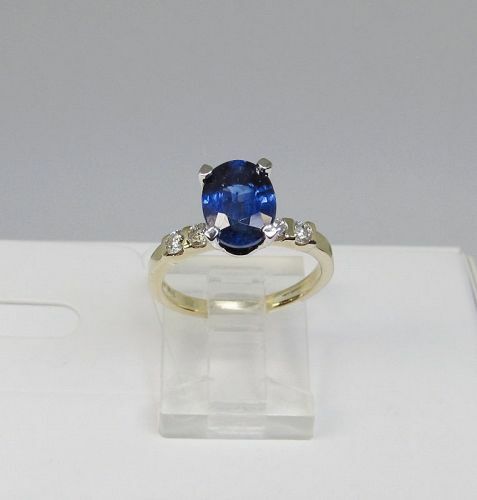 The approximate weight of all sapphires is 1.50Ct while the diamonds weigh approximate total weight of 0.12Ct. The ring is a size 7 ¾ and can easily be sized. 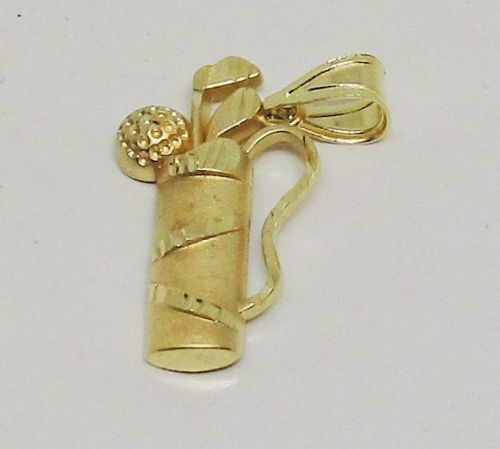 This 14Kt yellow gold golf bag charm / pendant is a great gift to a golf enthusiast. The bag is ½ high and ¼” wide at the widest part. 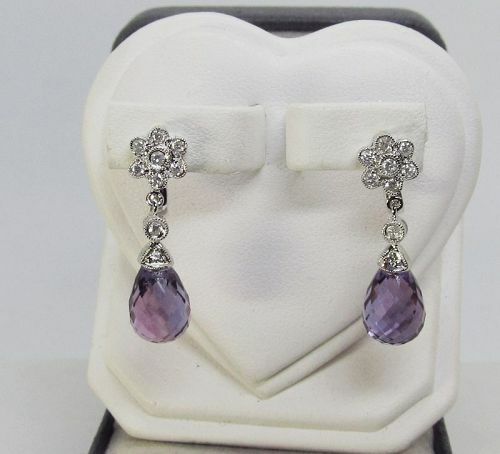 A 14Kt white gold pair of classic style diamond cluster earrings with hanging amethyst briolette. Each earring has a flower shaped diamond cluster on top, a bezel set diamond, a white gold cap decorated by a diamond and a fully faceted drop shape amethyst. The approximate total weight of all 18diamonds is 0.30Ct. The approximate weight of all amethyst is 7.0Ct. The diamond cluster and the faceted amethyst are 7 millimeter wide, and the length of the earrings is 15/16”. This pair of hanging deco style earrings is made of 14Kt white gold. 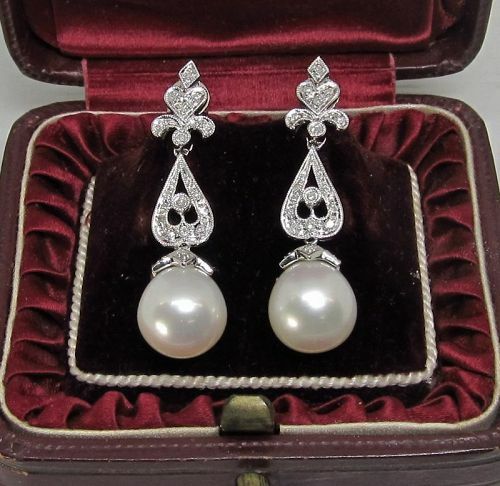 Each earring is decorated by 18 full cut diamonds and a 9.5 millimeter high luster pearl. The approximate total weight of all 36 diamonds is 0.25Ct. The widest part of the earring is the 9.5 millimeter pearl, and the height is 1 7/16”. A 1940-s diamond and 14kt white gold openwork cluster ring is set with nine single cut diamonds. The approximate total weight of all diamonds is 0.25Ct. The top of the ring measures 14 millimeters in diameter, and the ring is a size 8 ½. It can easily be sized. This pair of onyx and 14Kt yellow gold earrings is from the 1960-s. The round onyx is encased in 14Kt gold with a pattern in the front and a solid covered back. The 20 millimeter diameter earrings are 2 millimeter thick, with posts and ear knots. 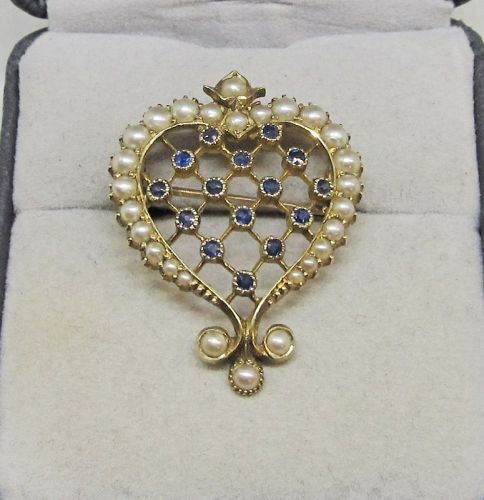 Very stylish is this finely crafted Victorian 15Kt gold sapphire and oriental pearl heart shaped broach/pendant. The 1 1/8” high and 7/8” wide openwork heart broach that is wearable as a pendant as well. It is decorated by 15 bezel set natural sapphires and 16 various size oriental seed-pearls. The period broach is marked 15Ct which clearly indicates that it was made in England. 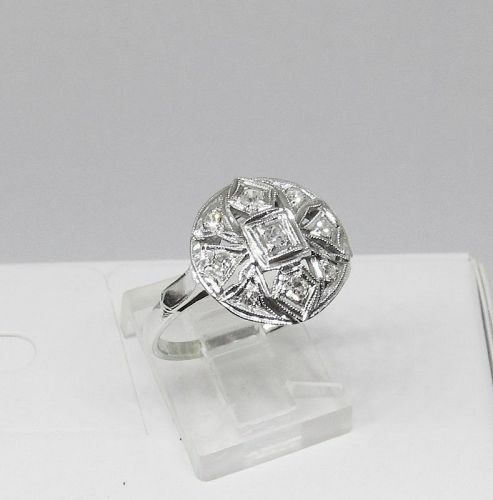 Anyone looking for an antique diamond engagement ring, this is the ring you should look at. 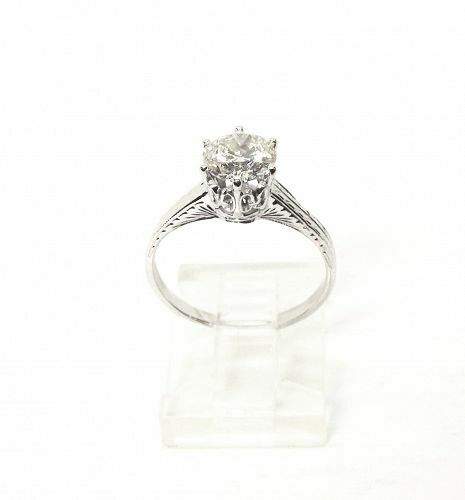 Dating back to the 1920-s is this beautifully created openwork 18Kt white gold six-prong basket setting that holds a 1.09 Ct old-mine diamond. The diamond is not certified, but our in-house gemologist graded it to be L color and VS2 clarity. This stone has a lot of sparkle, and the setting enhances that look. The ring is a size 6 and can easily be sized. 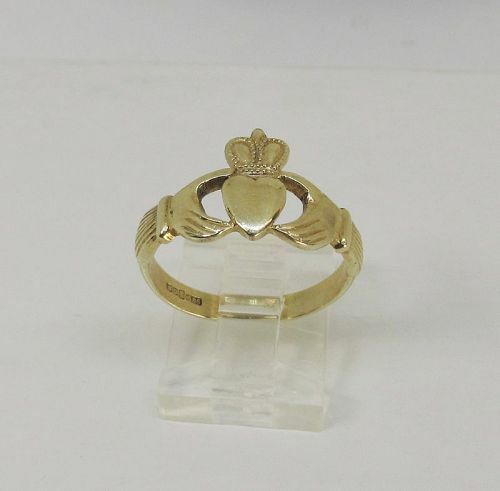 This 14Kt gold vintage claddach ring has British hallmarks. The top of the ring with the crown is 13 millimeter wide the narrowest part of the band is 3 millimeter wide. 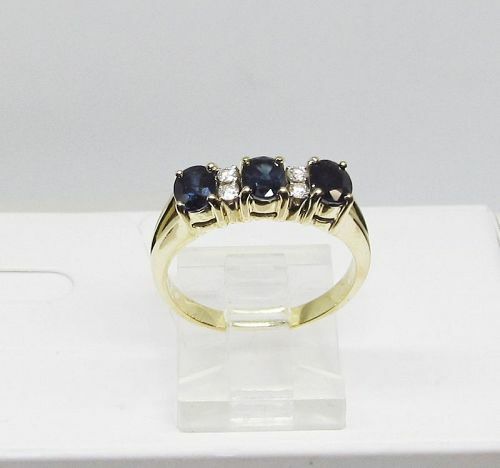 The size 8 ¾ ring is in great condition and can easily be sized. 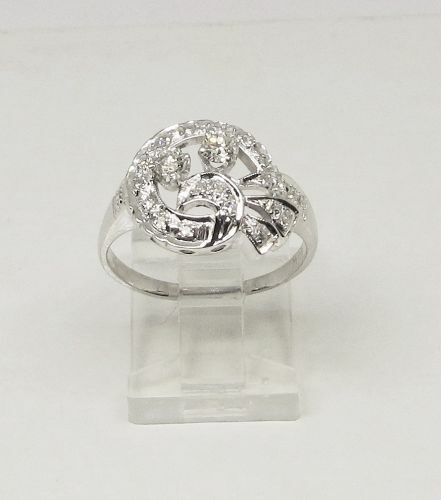 This gorgeous 14kt white gold and diamond ring is an artistic interpretation of a bouquet of flowers with a bow. The approximate weight of the 2 full-cut diamonds and the 21 single-cut diamonds is 0.50Ct. The diameter of the top of the ring is 14 millimeters. The ring is a size 8 ¼ and it can easily be sized. 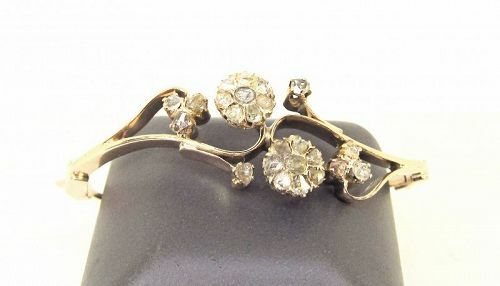 This is a very unique probably American made late Victorian 10Kt pink gold and rose diamond bangle bracelet with a flower design. The two clusters and the surrounding design is set with 24 various size and quality rose cut diamonds. The approximate total weight of all rose diamonds is 1.20Ct. The bracelet is quite heavy since it is NOT made of hollow gold, and fits an average or slightly larger than average wrist. 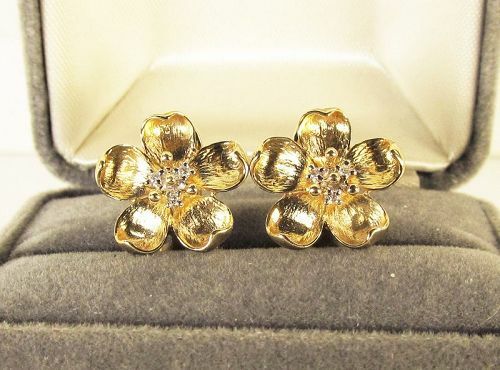 This pair of elegant estate 14Kt yellow gold and diamond dogwood earrings are from the 1960-s. The center of each earring is set with three brilliant cut diamonds. The approximate total weight of all diamonds is 0.12Ct. 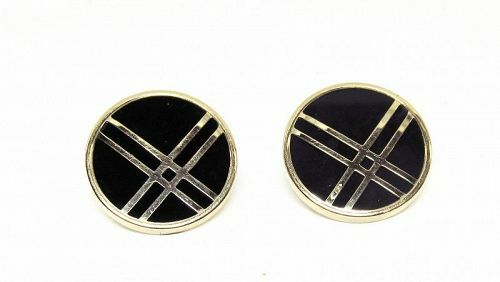 The 15 millimeter diameter earrings have a post and omega back combination. 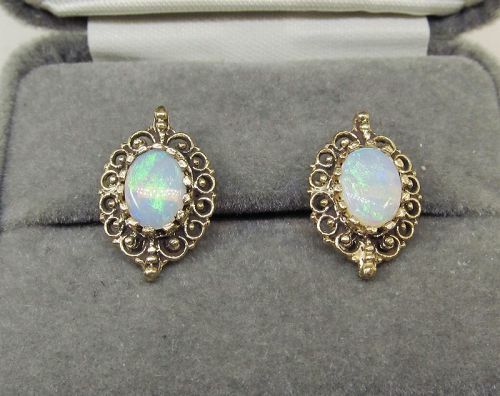 A pair of 14Kt yellow gold 1960-s Victorian style openwork earrings are centered by a pair of 8 X 6 millimeter oval fiery cabochon opals. The earrings have posts and the overall measurements are 12X 17 millimeters. 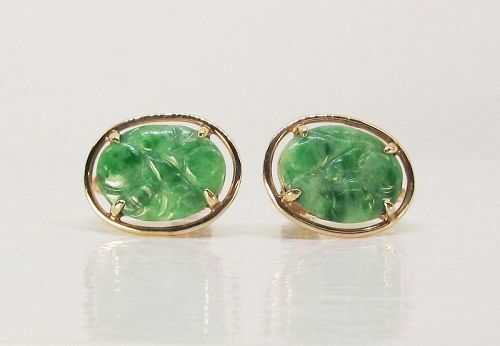 This pair of estate oval carved jade earrings is set in 14Kt yellow gold settings with none pierced screw backs. The 15 X 12 millimeter oval carved jade pieces are prong set in the center. The overall measurements of the earrings are 19 X 15 millimeters.